As more hospitals chase meaningful use and a more streamlined patient experience, health care job postings of all kinds increasingly indicate a desire for applicants who exhibit a familiarity with technology, especially EHRs. This is no different for HIM professionals. To prepare for this new reality, more HIM programs are integrating EHR training into their curriculum, whether through a virtual lab or by acquiring a system of their own. "Many of today's HIM programs utilize some type of EHR in their program," says Mary Beth Haugen, MS, RHIA, founder and CEO of Haugen Consulting Group who is also on the Regis University HIM program advisory board. Haugen says distance learning is becoming a popular training option. "AHIMA offers a virtual lab, which gives students an opportunity to gain hands-on experience with an EHR system," she says. "Most HIM programs have started integrating EHRs into their curriculum," says Ryan Sandefer, MA, CPHIT, an assistant professor and chair of the health informatics and information management (HIIM) department at The College of St. Scholastica, a private college in Duluth, Minnesota. 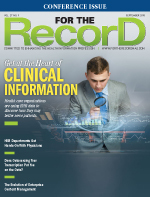 Sandefer says academic EHR vendors have been entering the market in a steady stream over the past decade. "The HIIM department at The College of St. Scholastica incorporated the Cerner EHR into its curriculum in 2001, and was the first in the country to do this," he says. "We have since incorporated other EHR applications and are always looking for new ways to meet course outcomes by using new technologies." For HIM programs in which classroom-based EHR exposure is lacking, Haugen says students can gain experience with some type of system during their practicum when they work at a facility prior to graduation. However, according to Joanne D. Valerius, PhD, MPH, RHIA, director of HIM graduate programs at Oregon Health & Science University, such training, which is integral in today's health care environment, shouldn't be left to happenstance. "Universities and colleges that have accredited HIM programs need to provide students with hands-on experience [with EHRs]," she says. Haugen says the benefits of exposing HIM students to EHRs are many, not the least of which applies to the reason students are in school to begin with: to gain employment. She says employers want HIM employees who can walk onto the job with at least a basic knowledge of EHR technology. "To me, the more that employees can hit the ground running, the better," Haugen says. "The majority of our clients have either a hybrid medical record or an EHR, so having that exposure to the key concepts and legalities of an EHR is going to help a new hire function at that organization." Data integrity is one concept HIM students should learn preemployment, Haugen says. "It doesn't matter what EHR is being used, it's critical that the student has a solid data integrity foundation to understand the importance of the correct data being associated with the correct patient," she says. "In addition, having the knowledge of the ramifications of inaccurate data and the need for ongoing monitoring is essential." Sandefer agrees on the importance of such experiential learning, especially when many students come into an HIM program with little to no health care experience. For those students, providing access to an authentic EHR provides context for current industry practices, he says. According to Sandefer, an even bigger benefit to providing students with EHR access is improving curricular outcomes. "EHRs are not an outcome, but simply a tool that can be used for teaching purposes," he says. "We use the EHR to teach concepts related to project management, clinical classifications, terminologies and standards, data analytics, systems analysis and design, and much more. We try to leverage the technology to improve learning, and we think we've made great strides in that regard." While cost and privacy issues—if students are accessing real patient data—are two obvious deterrents to incorporating EHRs into a curriculum, Sandefer says an even bigger factor for an HIM program wanting to pursue this line of teaching is time. "It takes a lot of time to train faculty to use these systems effectively, to integrate the tools into courses, and design new and improved curriculum around the EHR," he says. "And related to time is the issue of student training, support, and system maintenance. While it doesn't seem like a huge issue, password management can become a huge deal if you don't have the resources to assist with student support in your department." To overcome these obstacles, Sandefer advises program directors who are interested in obtaining an EHR investment to find someone—even themselves—to lead the charge. "Every department needs a faculty champion to push the EHR agenda forward," he says. "[It should be] someone who is innovative, creative, and effective at bringing interdisciplinary groups together to both develop curriculum and address problems. "It's also critical to gain support from the school's upper administration," he adds, noting that it's wise to explore free and open-source EHR options to better manage costs. Sandefer recommends program directors use the EHR as teaching tool, not as a concept itself. "In other words, the EHR navigational training should be the foundation for how you plan to use the EHR throughout your curriculum to meet a variety of educational outcomes," he says. According to Sandefer, students will find it difficult to land a job if they're not offered EHR training prior to graduation. "Industry is looking to hire individuals who have higher levels of informatics-related competence, including EHR-related skills," he says, adding that this applies to not only HIM but also to all other health care professions, "from nursing to social work to athletic training." Although some employers may prefer applicants who have experience with a particular system, Sandefer says EHR education in general will demonstrate an ability to understand the technology and its concepts. "The intent of using EHRs within academic curriculum should be education, not training," he says. "The focus should be on competencies related to the EHR rather than the EHR itself." In the long run, achieving such EHR competencies will not only help HIM students gain employment and health care systems improve data accuracy, it also will benefit patient care. "Patient engagement and satisfaction are a critical element of health care quality," Sandefer says. "If providers and other health care professionals are more competent using technology, the entire patient experience will be improved." At The College of St. Scholastica, HIM students are exposed to EHRs early and often. Since 2001, the HIIM department has offered an undergraduate degree in HIM as well as master's degrees in HIM and health informatics. Currently, the college is pursuing grant funding to obtain an EHR application. "Electronic health records are embedded across the curriculum in multiple courses from the first course in the program throughout, from technology applications and data analytics to human factors and usability," Sandefer says. Besides being trained on how to use an EHR in general terms, College of St. Scholastica students are also taught to use the technology as a tool to learn specific concepts. "Students use authentic [and deidentified] cases to learn how to properly code health information," Sandefer says. "Students are exposed to EHRs to learn how to construct decision-support rules. And students are required to access the EHR to write quality reports to better understand analytic techniques." At Oregon Health & Science University, a virtual lab plays a key role in exposing HIM students to EHRs. "HIM students are exposed to a virtual lab in the traditional first term, or fall," Valerius says, adding that every HIM-specific course attempts to include some type of hands-on experience. "That's not always possible, but it's a strong goal. A new course in clinical informatics offers students the opportunity to have hands-on experience with parts of the Epic software." Valerius believes such hands-on learning is paramount to properly educating students before they enter the workforce. And with practicums becoming more difficult to find due to privacy and workload issues, she says hands-on learning in a classroom setting becomes more important, whether that learning is in person or online. For any education program considering an EHR investment, Haugen says the type of system matters much less than simply having a system. "I think any level of exposure is good," she says. In the end, the name of the EHR isn't as important as the exposure and foundational concepts the student gains from such training. "It's going to help students apply book learning to an actual EHR," Haugen says. "If they need to modify what they've learned once they get out in the real world, I think it will be much easier than if they had no EHR exposure at all. "An EHR may look a little different, but the foundation and concepts are the same," she continues, noting that early EHR exposure can mean the difference between students fearing the technology or embracing it on day one at their first job.